It was a scorching summer afternoon when I first visited Kanchipuram. The town was bustling with business as usual. The hot sun did little to the people of Kanchipuram. And I couldn’t trace a sense of aversion in their faces. Sitting in an air conditioned cab with my family and still dabbing off the sweat, I noticed that women of my age did not seem to care about the heat. They walked in the sun unperturbed without even an umbrella. I looked for my umbrella, to keep in handy the moment I would get down on the car! I smiled at the difference and wondered about those women. The town looks to dabble between modernization and olden days, as I saw a diverse mixture of both. The main streets of Kanchipuram look as if they’re trying to run the rat race called urbanisation – Huge billboards, big complexes with glittering hangings, a small mall like shop, lighting and food joints mushroomed up. The smaller bylines remain idyllic, showing no signs of enrolling for the race. The city is moving in its pace and living in its little world. 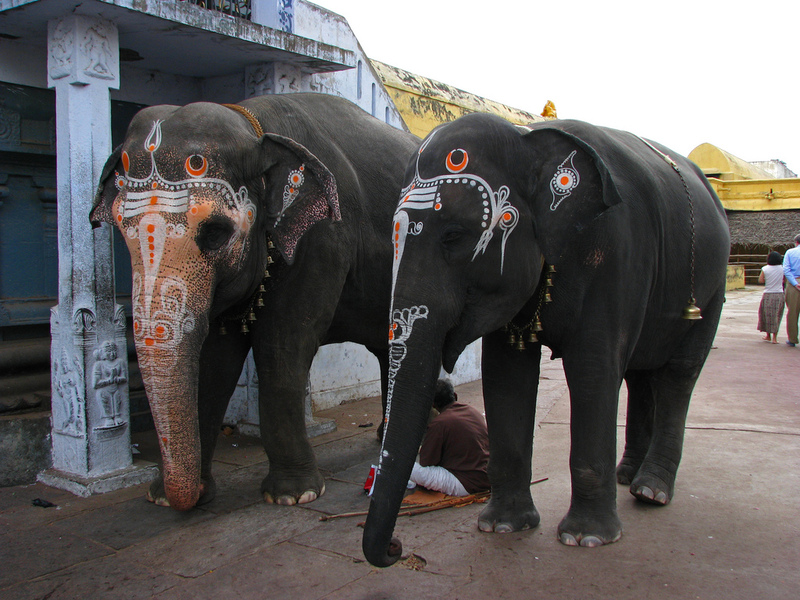 Enriched with traditions and culture, Kanchipuram can be experienced better if you begin to notice the subtle vibrancy. What caught by immediate attention were the billboards of course. The colourful billboards were omnipresent. The rival saree and jewel owners were trying to vie for every eye-catching place to post their advertisements. It in fact coloured Kanchipuram with different shades, which otherwise wears a mono colour of sandstones. 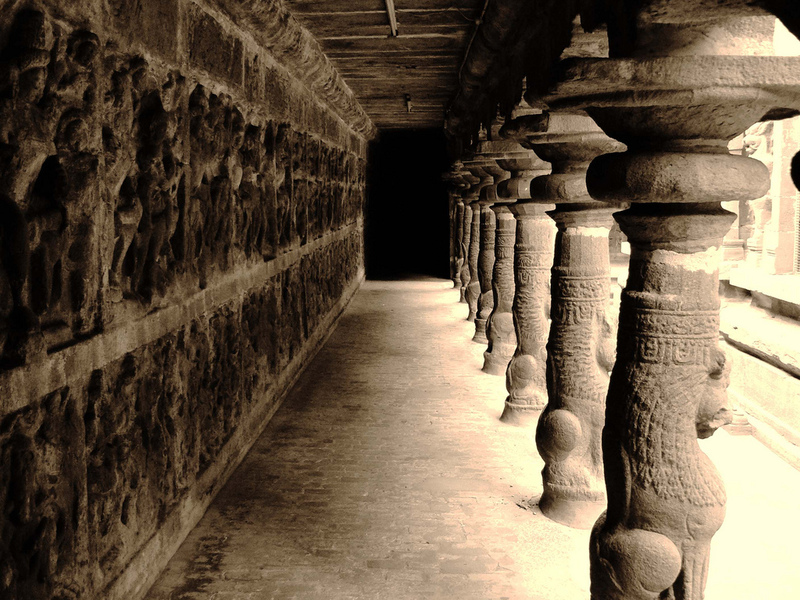 I dug a bit into knowing the past of Kanchipuram. And I found out that this town was an ancient capital city of the glorious kingdoms, that ruled South India for decades. The town is as old as the 6th century.And the inscriptions on the walls of the temples giving an insight into the dynasties which once ruled Kanchipuram. Kanchipuram is popular in the world for the age old traditional silk sarees, which forms a necessary thing in Indian weddings, especially in the south. Women love to splurge on the most expensive saris for their best day. 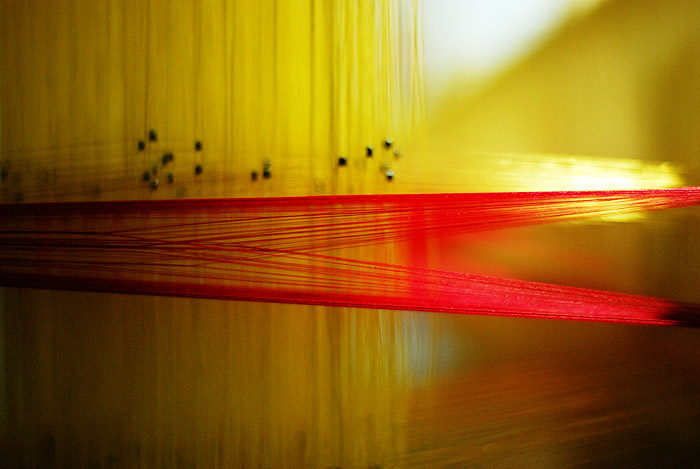 Some even go the length of choosing a tailor made saree as per their desire. The same applies with the jewellery here. Gold ornaments are a hot favourite among women who come from far off cities, just to shop for silk sarees and the jewellery. Not being a fan of either of the two, my attention went to what I loved – the ancient temples and the historic structures. 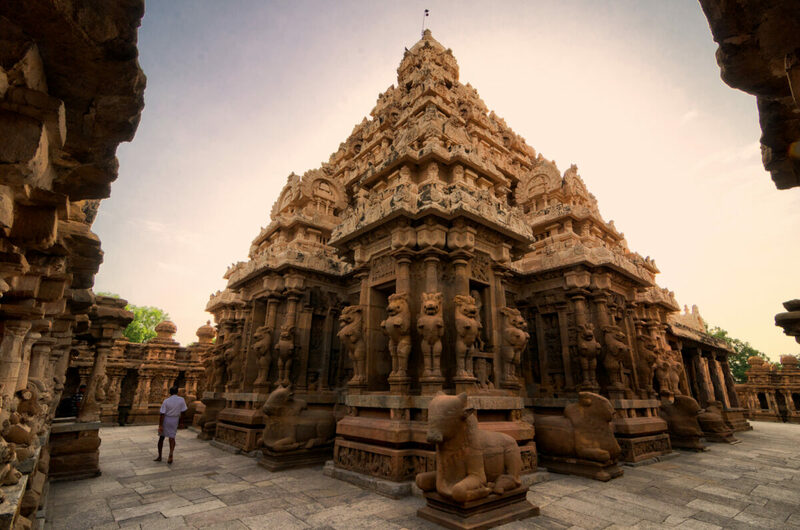 Kanchipuram is known as the ‘land of thousand temples’ and the moment you walk through the streets of Kanchipuram, you’ll know why. Dating back to some 300 years to 500 years, all of these temples are magnificently built. I fell in love with the craftsmen ship of the artists. They’ve created massive, majestic structures out of clear stones. These stones sprung to life through the brilliant skills of these artists. The structure of these temples has such an intricate and descriptive architecture that you would feel lost in time, trying to articulate their significance. I couldn’t stop admiring the hands behind those magnificent structures. Kamakshi temple is one of the prime temples of Kanchipuram, and the moment you enter, you’ll be awed by the majestic carvings on the walls of the temple. The entire area of the temple is very huge, gorgeous mythology with sculptures depicting the characters from Indian mythology. This temple houses a gallery dedicated to Shankaracharya – one of the greatest saint/mystic/philosopher of ancient India. We headed to Ekambarnath temple, as the sun continued to beam. 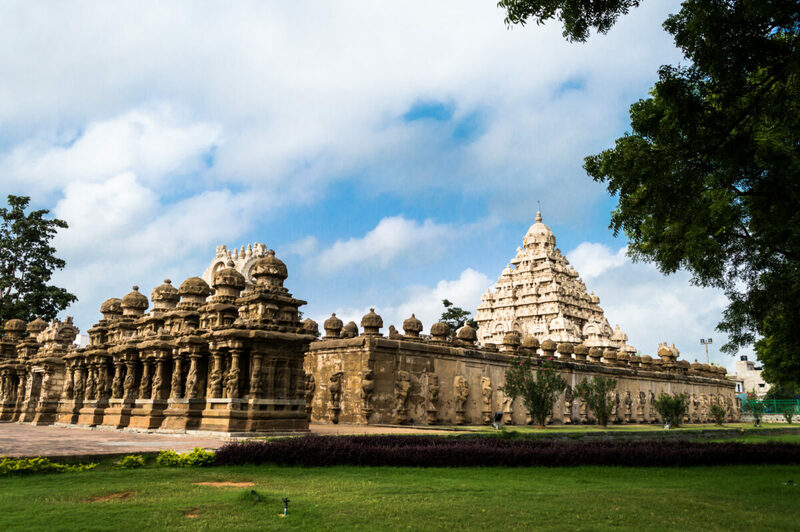 This ancient temple of Kanchipuram is known for its stunning architecture, rich history and amazing sculptures. The corridors of this temple are the longest in the world. It is constructed with perfect symmetry and dimensions.It is a testimony to the marvels of engineering of the olden days in India. The corridor has very high ceilings, with the inner side filled with detailed carvings and scriptures. They depict the details of rich mythology. I was fascinated by this corridor, which has withstood the test of time to tell its stories. Another attraction is a mango tree, which is said to be 3,500 years old! I was dumbfounded by this fact, as the tree in no way looks like that! If not for the spiritual aspect, these temples are a must for anyone who is fascinated by tales of time and the magnificent architecture of these monuments of ancient kingdoms. I loved the effort which the locals have taken to keep the old nature of these temples intact. In fact, many of these are heritage sites now, and this is a good sign. Although I could not visit all the temples, I fell in love with the ancient times. 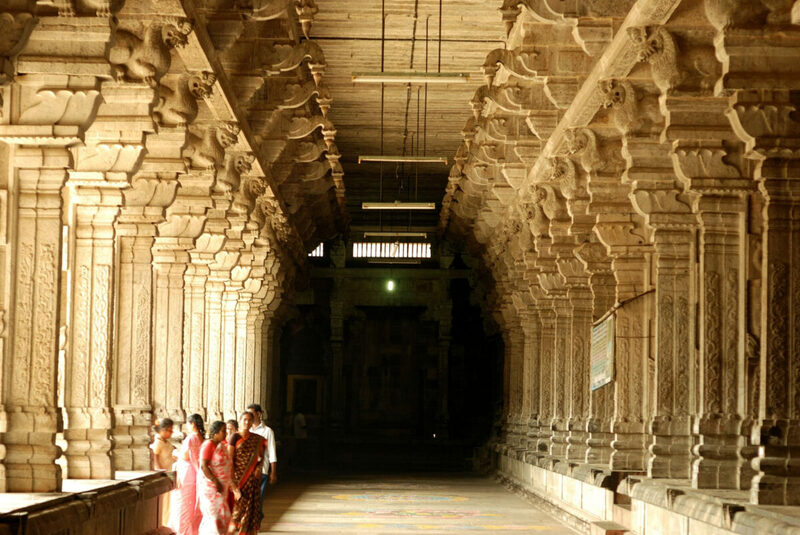 The glorious past reflected through the structures of these temples of Kanchipuram. If you want to know about the deep rooted culture and the ancient heritage of Kanchipuram, visit Kanchi Kudil. It is a 90-year-old house encompassing the typical ancestral style of construction. From the furniture to old things, including the commonly used materials in day-to-day activities during ancient times, this property has a gorgeous collection. It gives a glimpse of the tradition and the ways of the people. I loved the way they have organised all under one roof, keeping the modern amenities and yet not trampling the bygone era of the house. The food they serve here is authentically local, which I liked a lot. I came out of the house, and the town of Kanchipuram enriched with knowledge, tired and tanned. But, the wanderlust in me focused on the best part (as usual!) of my short but a very sweet encounter with the enriched city of Kanchipuram. I left the city on a hot day. As the sun continued to relentlessly try to confine the locals to indoors with his blazing heat, the people indulged in their activities un-fluttered! 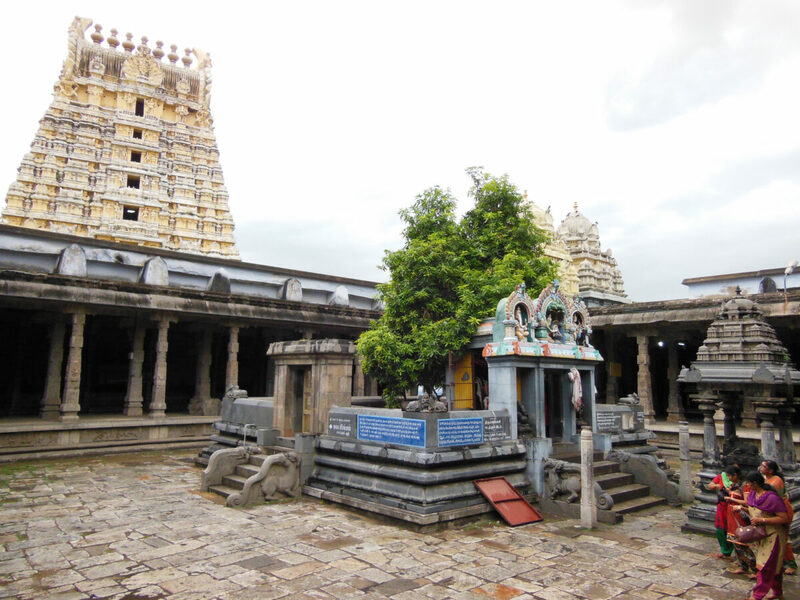 Located about 75 km from Chennai, it is the most easily accessible places to reach Kanchipuram. Nevertheless, Kanchipuram is well connected by road to most cities in South India and reaching there shouldn’t be a problem. The best time to visit is from October to late February. It is preferable to wear light/cotton clothing once you are here. Of course, one of the best places to visit for history and architecture lovers! So, how was your experience in this temple town? Got some stories?